Pasang Sherpa, owner of an adventure travel company, is worried about his Sherpas. 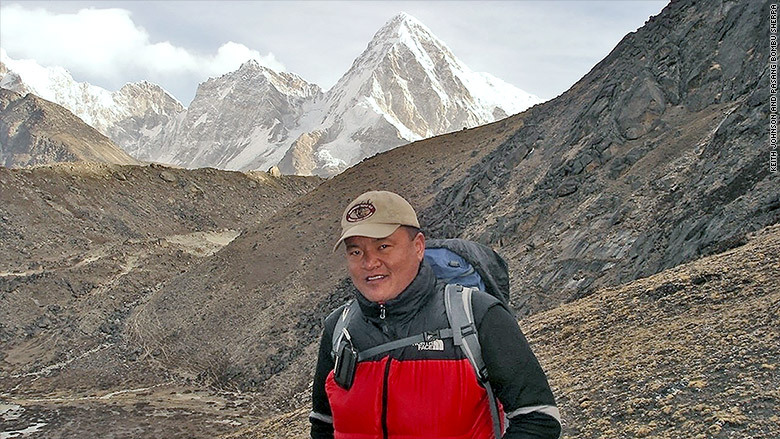 As the owner of an adventure travel company, Pasang Sherpa helps tourists from all over the world explore the rugged Himalayan mountains. But the recent devastating earthquake in Nepal has led to a collapse in the tourism industry there and put his entire staff of 400 out of work. All his Nepal-based workers include sherpas, porters, cooks and drivers. "I have never seen such chaos," said Pasang, a native of the Mount Everest region and owner of Trek Himalayan, which specializes in trips to Nepal, Tibet, Bhutan and India. Pasang is extremely worried about his staff and is trying to think creatively. He believes his sherpas can be useful as Nepal tries to recover from the one of the worst natural disasters that the country has ever faced. "I'm trying to figure out a way to support my staff," Pasang told CNNMoney. Many of his guides, like the ones pictured below, speak English, so they can help international aid organizations communicate with the locals. While aid has been pouring into the Himalayan city of Katmandu, delivering it to remote villages has proven difficult in the immediate aftermath. Not only can Pasang's army of mountain guides communicate with global groups, but they also know the area well and can direct resources to the places that need it the most. Some of them have first-aid training as well. 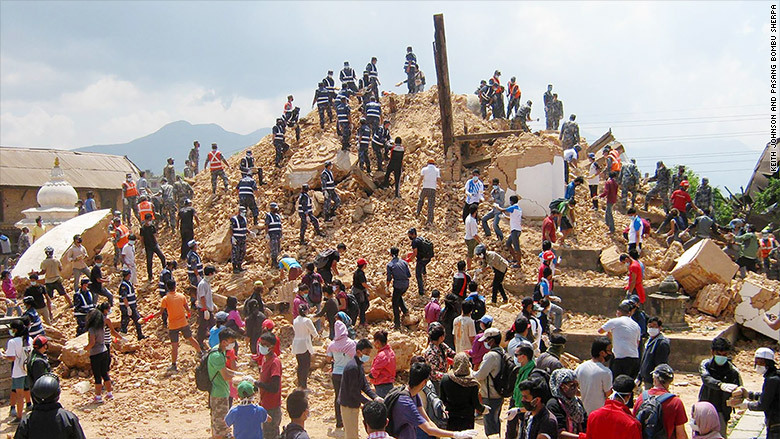 There's no question that there's urgent need for relief in Nepal. The magnitude-7.8 earthquake that hit the country on April 25 caused widespread devastation and the death toll has surpassed 7,500. A photo taken by Pasang's brother in Kathmandu. Pasang himself established a charity this week, Everest Aid, and has been seeking donations. The immediate goal is to get basic supplies, such as tents, food and water, to villages before the monsoon season starts. It's a way for him to help not only Nepal but also keep his employees whole before the hobbled tourism industry comes back. He said the spring climbing season has effectively been canceled and that it could be years before the famous Himalayan tea lodges are rebuilt and tourists return in significant numbers. That's a huge concern for the millions of people who rely on tourism dollars for their livelihood, said Pasang. 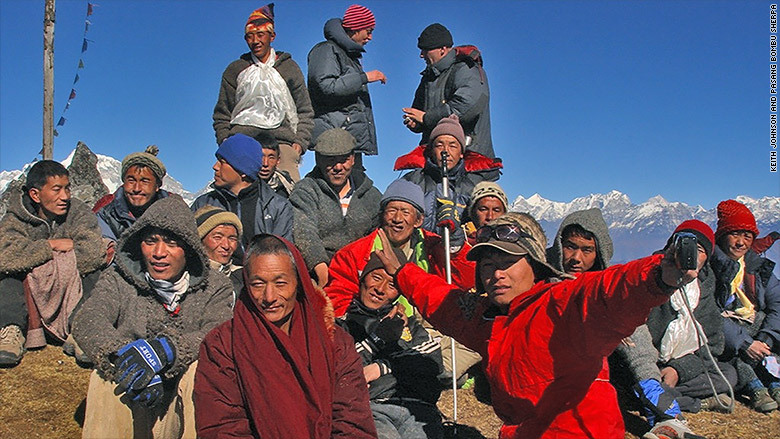 "There are a lot of climbing sherpas out there and we're trying to put them back to work," said Pasang. "It will take five or six years to rebuild. The country has fallen apart." Two porters cary packs in Nepal. Tourism is one of the few sources of high-paying jobs in Nepal. The nation's economy is driven by agriculture and has been undermined by years of political dysfunction. Sherpas, as Nepalese mountain guides are known, can make a decent living carrying heavy loads for tourists up and down mountains. But they work under treacherous conditions and often put themselves at risk. Almost exactly one year ago, 16 Nepalese guides were killed in an avalanche near Mount Everest base camp. Now, Pasang hopes he can help his staff get back on their feet so they can begin to rebuild the country.